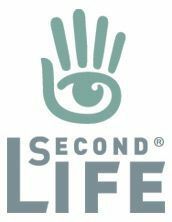 On Friday, February 3rd, Linden Lab released the latest Maintenance RC viewer – version 5.0.2.323359 – which brings with it another round of updates and fixes, together with a couple of new features requested by users, one of which could prove popular for creators and builders: the ability to select default folders for saving uploads. Also for builders, the RC includes some long-awaited fixes to the build floater / objects when building. Several other niggles people have had with the viewer are also fixed with this update, making it a handy set of improvements to have. The following is not intended as an in-depth review of the RC, but is intended to highlight the core changes. 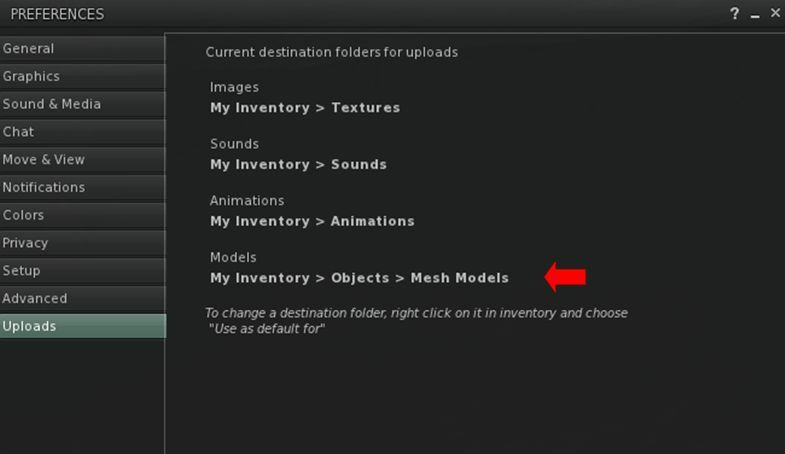 With Maintenance RC 5.0.2.323359 users can now select their own preferred inventory folders into which uploads – images / textures, sounds, animations and mesh models are saved by default (rather than having all textures + images go to Textures for example). 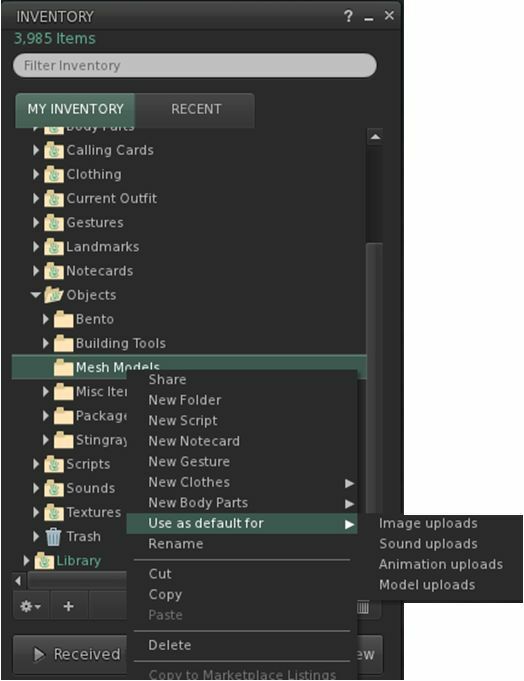 Go to Inventory and right-click on the desired folder. Select Use As Default For. This opens a sub-menu of upload types (shown on the right). Click on the type of upload you wish to always save to that folder. Note that this only applies to uploads: images / textures, mesh models, etc., received via transfer will still go to the their “default” folders. So, for example, an animation passed to you in-world by someone else will still go to your Animations folder, regardless of any custom destination you have set for animation uploads. You can also review which custom folders you have set at any time via Preferences > Uploads, a new tab in the preferences floater. This list updates dynamically as you select / change custom locations for your uploads. A long-term and understandable annoyance among role-players / combat players is that a change made by the Lab some time ago meant that the Damage icon would not show in parcels that were damage-enabled. This has now been reverted. The issue of the Sun sometimes appearing to jump around rather than moving incrementally has been fixed. 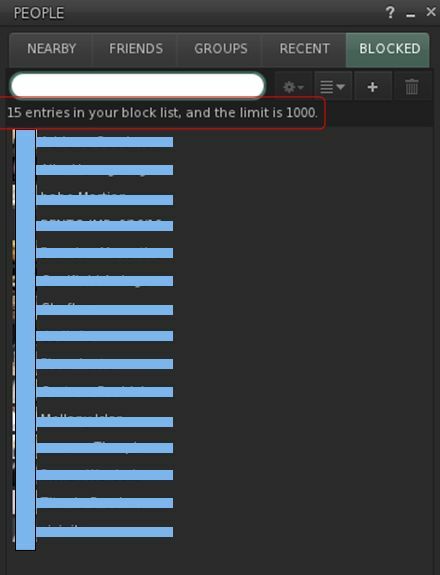 The Block list has been updated so that the last name on the list once again displays correctly, and a tally has been added to show number of avatars / objects blocked, and total limit (see right). Avatars should now correctly display after a fresh inventory fetch. Changes in wearables should now properly save. Repeats per meter value is now correctly saved. An object created when a linkset is open is now shown in the linkset list. Select Face will now show selection for all faces until such time as an individual face is selected. The contents of any object worn from the ground should now correctly update. The Script Debug Floater should now be useful once more. Hanging texture downloads have been cleaned-up for better performance (via contribution from Ansariel Hiller). Viewer Login will no longer save password when it is not supposed to. Beacons will once more show when in Mouselook. Teleport location selected from World Map no longer omits Z value. Grid selection short cut at login is fixed. Crash Fixes in LLPanelEditWearable::isDirty(), LLFloaterIMContainer::visibleContextMenuItem(), opening many scripts. /displayname and /completename no longer change when toggling “View Display Names”. Link added to Events in World menu. Full details on the viewer updates, included a list of resolved MAINT JIRAs can be found in the viewer release notes and download page. Note that as they are MAINT (LL internal), not all of the JIRAs may be open to public view.